Next term, I’ll be teaching a brand-new graduate biophysics course. (It’s the first time teaching a graduate course in my eight years as a professor!) I’ve spent quite a while thinking of what should be in it and how the course should be structured. Here, I’ll just note my list of topics (below, with a few comments), and provide a link to the syllabus (here). Hopefully in weeks to come I’ll comment on how the course is going. We’ll review concepts in probability and statistical mechanics. We’ll discuss a classic example of how a quantitative understanding of probability revealed how inheritance and mutation are related. We can make sense of a remarkable array of biophysical processes, from the diffusion of molecules to the swimming strategies of bacteria to the conformations of biomolecules, by understanding the properties of random walks. We’ll figure out why bacteria swim, and why they don’t swim like whales. We’ll see how entropy governs electrostatics in water, the “melting” of DNA, phase transitions in membranes, and more. We’ll look more at the mechanical properties of DNA, membranes, and other cellular components, and also learn how we can measure them. Cells sense their environment and perform computations using the data they collect. How can cells build switches, memory elements, and oscillators? What physical principles govern these circuits? How does a collections of cells, in a developing embryo, for example, organize itself into a robust three-dimensional structure? We’re beginning to understand how multicellular organisms harness small-scale physical processes, such as diffusion, and large-scale processes, such as folding and buckling, to generate form. We’ll take a brief look at this. We live in an age in which we can shine a laser at particular neurons in a live animal to stimulate it, paste genes into a wide array of organisms, and sequence a genome given only a single cell. It would be tragic to be ignorant of these sorts of almost magical things, and they contain some nice physics as well! As you’ve probably concluded, this is too much for a ten-week course! I will cull things as we go along, based on student input. I definitely want to spend some time on biological circuits, though, which I’m increasingly interested in. I also want to dip into the final topic of “cool things” — I find it remarkable and sad that so many physicists are unaware of fantastic developments like optogenetics, CRISPR, and high-throughput sequencing. Students: prepare to be amazed. 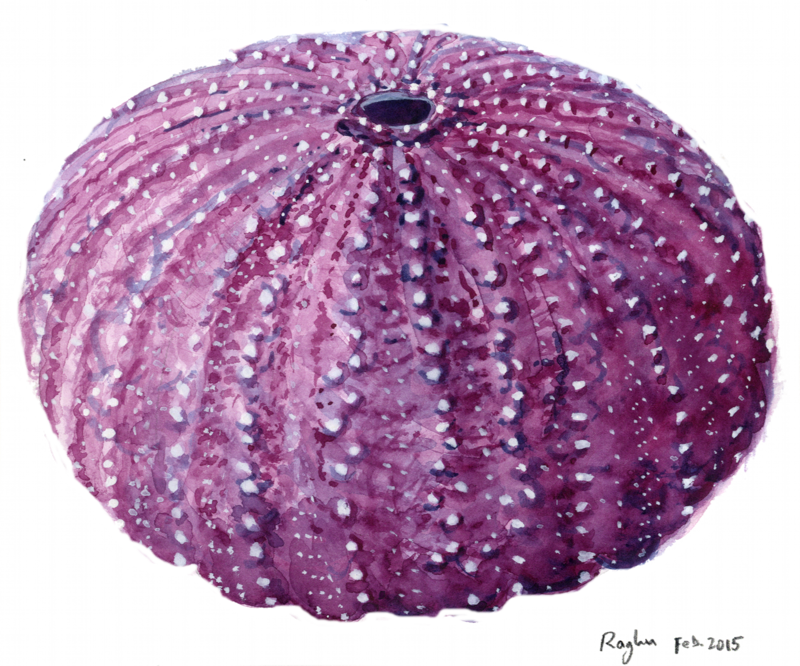 My sea urchin illustration above has nothing to do with the course, but if you’d like a puzzle: figure out what’s severely wrong with this picture.